Research Park at FAU celebrated some of the region's most influential entrepreneurs, inventors and business leaders at the 2018 Research Park Annual Awards and Celebration of Entrepreneurship. Congratulations to this year's recipients, including Gregg Fields, Ph.D., Distinguished Researcher ; Daniel Cane; Distinguished Entrepreneur; Steven L. Abrams, Distinguished Leader and the SBDC at FAU, Distinguished Organization . 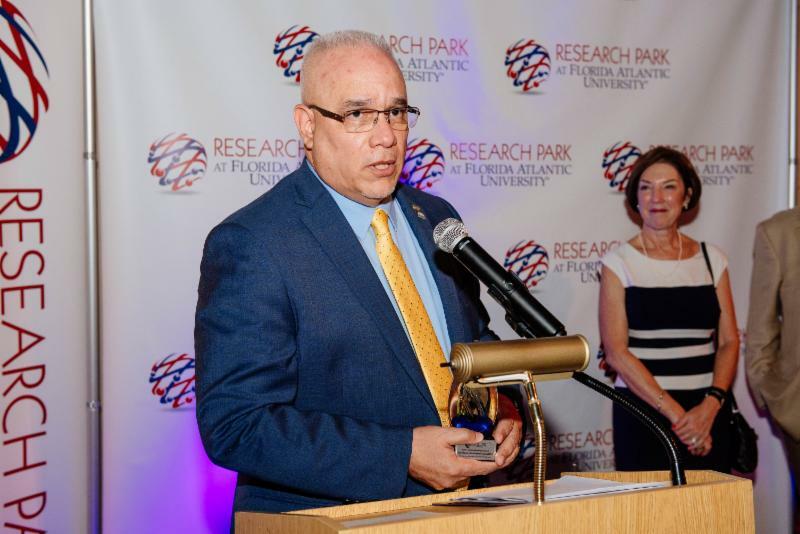 Research Park is an innovative hub whose mission is to build an entrepreneurial community; supporting research, development activities and collaboration across FAU and South Florida. 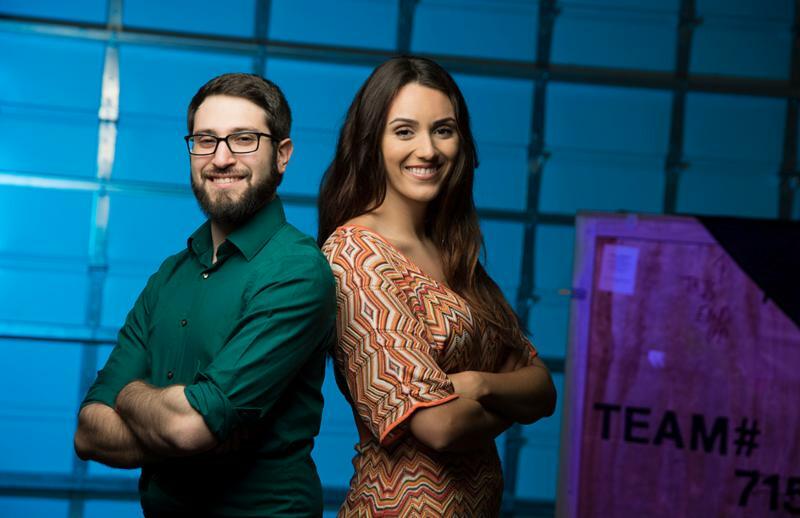 Evita Conway and Michael Kleiman, c o-founders of SciKey Diagnostics, an FAU Tech Runway Venture Class 6 company, took second place at the statewide 2018 Florida Blue Health Innovation Pitch Competition. The startup company creates models for clinical diagnosis and risk assessment of mental disorders, based on state-of-the-art behavioral and biometric measures, including eye movements and cognitive exams. FAU's Division of Research will sponsor Michael’s attendance at the 2018 BioFlorida Conference . You're invited to the 2018 Maverick Reception, celebrating a year of entrepreneurial success, innovation and all those who make it happen. Festivities will include interactive exhibits, light bites, live presentations, networking and entertainment. Exhibitors include Bionic Glove Project , BiUwAVe , Child Rescue Coalition, Land of Zorth , LockItPlates , Nesvio , SlideMap , Tech Garage and TwoDegrees . 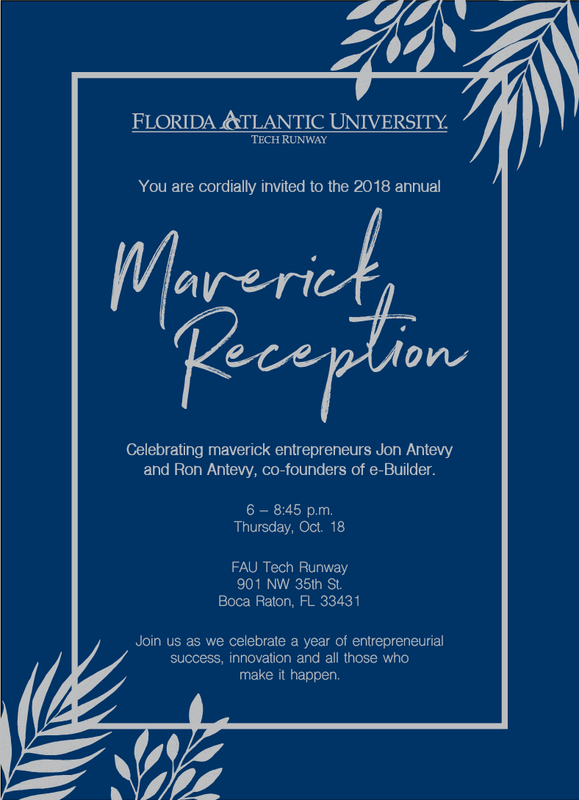 The event will also honor annual Maverick Award recipients Jon Antevy and Ron Antevy, Maverick Award for Entrepreneurial Achievement; Carly Asher Yoost, Maverick Venture of the Year Award and Neil Katz, Maverick Mentor of the Year Award.